Although Shakespeare said that What is there in a name ? i believe that a lot is there in a name. Name is our identity. It is how we are known to others. I have also analyzed that in most cases one can find the traits of characteristics of name in people. For e.g. people whose names are related to music are usually good musicians or singers, people who are named after gods or goddesses are usually successful, people whose names mean beautiful are usually pretty. This is not the case all the time but as per my interaction its mostly true. I just love my name. Actually speaking i am proud of it. I love my parents for giving me this name. I have tens of nicknames but my actual first name “Jayati” is my favorite. I like its sound. I like its spelling. I like it in every possible way. I like that it begins with the letter 10th letter J. Thus i will never change my name ! Here are a few images of my interpretation of “Forward”. This is the lush green pathway which leads to my college IIIT-B. At the entrance there is Goddess Saraswati, “The Goddess of Knowledge” guiding me in my life ahead ! This is the place where i learn something new everyday. This is the place which makes me realize my capabilities & strengths. This is the place where 3 things happen – growth, growth & growth. This is the place which teaches me to look at life from a new perspective. This is the place where each day is buzzing with a lot of activity. This is the place where i made a lot of friends. This is the place where i came to know myself. This is the place where i move “Forward” ! When i know it can only give momentary happiness. When i know it cannot buy all the love and joy. When i know they won’t be able to give it. When i know my desires can never be completely satisfied. When i am not even sure what exactly is happening to me. When i don’t even exactly know who am i. When i know first i must change myself. When i know divinity is present within me ! Eat Pray Love is a true story of Elizabeth Gilbert or ‘Liz’. This book motivates us to face all the challenges of life boldly, not to give up, to listen to one’s heart and most importantly to make ourselves content and happy. The book has been written in a very beautiful way. No doubt it is a bestseller. Liz is married and has everything in life one can dream of. But she is not happy. So after struggling a lot she ends her marriage. After divorce she is filled with sorrow. She can’t see what is happening in her life. And thus she goes into depression. It is one of the most difficult phase of her life. She loses a lot of weight and thinks of self-destruction. Finally she realizes that no one else can make her happy. So she will have to make the efforts herself. She always wished to learn Italian language. It had no specific reason but she just wanted because she liked it. Secondly through a friend she came to know about a spiritual guru whom she made her guru. She wanted to visit her ashram in India. Finally a few years back a medicine man had read her hand and told her that she would come back to Indonesia and he would teach her everything. 108 is considered to be a good number. So this book has 108 chapters. The book is divided into three parts each of 36 chapters. So Liz decided to take a one year break and spend 4 months each in Italy, India and Indonesia (3 I’s). This part describes her stay in Italy. She learns Italian from a person there and teaches him English. She has a great time in Italy. She make a lot of friends. She spends most of the time eating 🙂 in Italy. Every day she visits new restaurants and enjoys a variety of sumptuous food like pizza and pastries etc. Slowly she starts feeling good and regains the lost weight. The next part of the story leads to India. She stays in an ashram near Mumbai. She learns meditation. In the beginning it is very difficult for her to meditate and concentrate. But slowly she learns everything. She discovers tranquility and peace within herself. The last part leads to Indonesia. There she again meet the medicine man. She helps a lady to buy a house for herself by asking all her friends to contribute. And finally she finds love again. She meets Felipe and both fall in love with each other. Since both are divorced they are not ready to marry immediately however both are ready to lead a happy life together. But even then sometimes i doubt YOU. But i forget this and think i am all alone. But even then i forget YOU. But i being selfish, think of YOU only in sorrow. So that even i can love YOU the way YOU do. Because i know i am nothing without YOU. Because i will get lost without YOUR guidance. And direct me so that i can perform my best. I didn’t have YOUR address so i thought i should put this letter on my blog, so that YOU can read it while YOU surf the net. Also i would be highly thankful and feel blessed if YOU replied my letter. 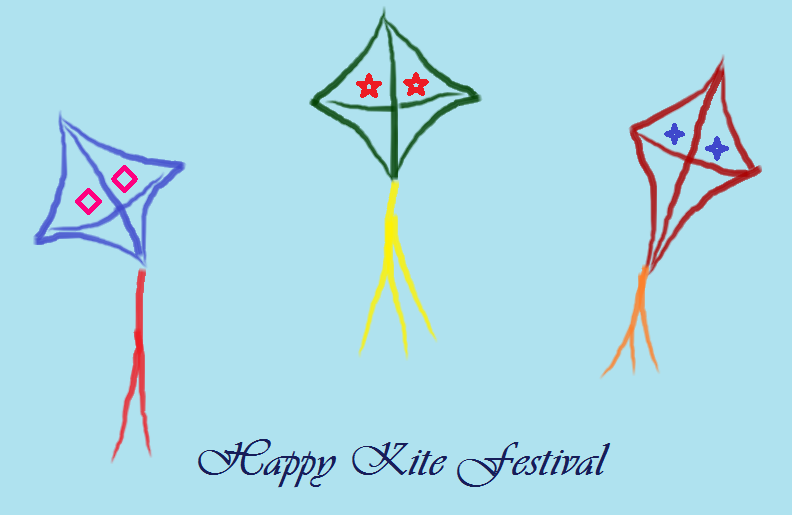 14th January is celebrated as the Kite Festival also known as Uttarayan in India. Hundreds of kites are bought and made ready beforehand for the d-day. One can see innumerable kites of various types soaring high in the sky. This festival is specially celebrated with great pomp and show in Gujarat. Since the break of dawn people start assembling on their terrace and fly kites. The weather is also windy and thus favorable for kite flying. Whole day is spent in flying kites. People have breakfast, lunch and dinner on the terrace itself as no one wants to miss a single moment of fun ! People of all age groups from small children to youth and old can be seen enjoying this festival together. It requires energy and strength to rise. Special efforts are needed to do so. But to fall down is easy. Nothing needs to be done. Gravity does its job well. In the same way we also need to put in some extra efforts to reach a higher level. To go with the crowd or to go along the stream is always easy as it does not require any hard work or extra effort. If there is no wind it’s very difficult to fly a kite. It is difficult to rise up in the sky. Similarly even we need help and support of others to reach our goals. It’s the string which guides and directs a kite, however it’s almost invisible. Similarly we are constantly guided and motivated by our guides and gurus from the backstage. They play an indispensable role. Just like a kite cannot fly without the string even we will be nowhere without our guides and gurus. Every one sees the kite but forgets the tail. It plays a major role of maintaining the balance of a kite. Similarly even in our life small things affect the journey of life and must be given the required importance. A kite may get cut by another kite. Similarly sometimes we may be defeated by someone who is better than us. But it’s not something to be ashamed of. We can always learn and imbibe a new lesson from every difficult situation instead of running away from it. Numerous birds are injured or killed by the kites. Similarly sometimes our behavior may break someone. Lets try to achieve our goals in such a manner that others are not adversely affected by it. As it is rightly said live and let live. So lets not harm others to achieve our objectives. A kite can fly with same efficiency and reach the same heights irrespective of the color of the kite or of the type of material of which it is made. Similarly every person can achieve their aims and objectives irrespective of their religion, caste or creed. So let’s have a broad outlook and not differentiate people on these petty issues. Each one of us is capable of achieving our goals. A kite can go on higher and higher up in the sky. Similarly we can reach unprecedented heights. All that’s required is dedication, hard work and most importantly persistence to reach our goals. A kite can only be a showpiece by itself. It cannot reach the heights all by itself. A kite is able to move up due to the combination of various factors. And a kite must be aware of it. Similarly we can’t do anything if we have a big ego. It’s always a good team that reaches its destination in the best possible way. Lets convert ‘me’ into ‘we’. After getting cut a kite may get struck on trees or poles. Similarly in life we may face difficult (not impossible) challenges and get struck. But we must know that it’s not the end. With a little bit of extra effort we can overcome any adversity. A kite which is properly designed can reach greater heights with minimum efforts. Similarly if we are prepared to face all the situations with ease in life then we can achieve our goals more easily. The string of the kite is left loose so that it may not get cut by another kite. If the string is tight and tense it breaks more easily. Similarly we need to d-stress ourselves. Stress is a big killer and it prevents us from wholeheartedly enjoying our life and hinders in achieving our goals. So from a kite we can learn to let go in some of the difficult situations in order to avoid getting stressed up. Along with the qualities of a kite the success of a kite also depends on the flier. In our case, we are the kite and God is the flier. So in some cases we may give our 100% efforts for a cause but sometimes the final results depend on luck and God. So lets learn to accept it willingly. Some things may happen as destined. But at the same time it also does not mean that we should stop working to reach our goals. After getting cut the kite belongs to the person who catches it. It no longer belongs to its previous owner. It’s again ready for a new flight. Similarly after facing a difficult situation we change. We are no more what we used to be. We learn from our mistakes. And finally we are again ready to face new challenges on the path ahead.